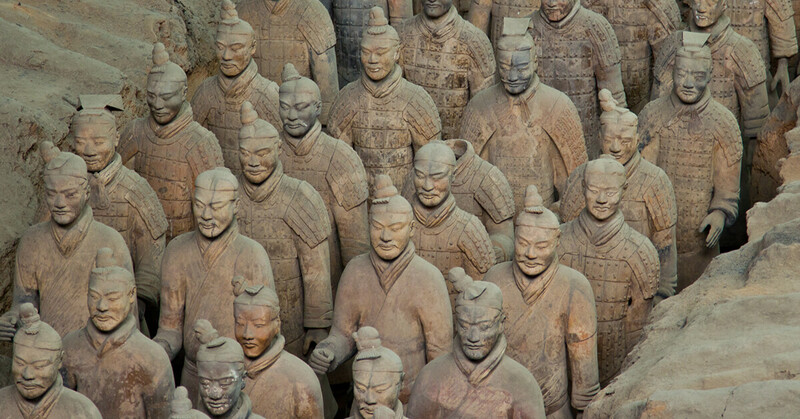 Have you ever wondered what’s the story behind the Terracotta Army? It so happens that, on a lazy Sunday afternoon, I discovered an amazing documentary about the Chinese emperor who ordered the creation of the terracotta statues of his soldiers. While learning more about ancient China, I realized that this 2,500 years old civilization had an incredible onboarding process (better than some modern-day companies) and we can learn a lot from it. Back in 1974, two workers were digging a well outside the city of Xi’an, in China. Their shovels hit what they first thought was an old pot. The more they dug, the more they realised that they were looking at a statue of a man. They had no idea they accidentally stumbled upon one of the greatest wonders of our world: the Terracotta Army. For 2,200 years, this subterranean life-size army of 8,000 terra-cotta warriors has silently stood guard over the soul of Emperor Qin Shi Huang. This amazing tomb speaks loudly about this man’s great ambition. With the help of his army, he triumphed over the other Warring States and unified all of China, for the first time in history. There are many factors that contributed to Emperor Qin’s success, but one thing is for sure: he had an amazing onboarding process. He took illiterate peasants and turned them into deadly warriors. Overnight. How was that even possible two thousand years ago? Some amazing clues were revealed by archaeologists while analyzing the Terra-Cotta Army. Though the term onboarding might sound too modern, you’ll be surprised to learn how Emperor Qin handled his new hires. Emperor Qin’s methods were ancient, but his tactics can still serve as a source of inspiration for many businesses today. Because how can a business thrive in today’s fast-paced world if not with agility, determination, and a great work process put in place? Say you found the ideal person to fill in the open position in your company. They are full of enthusiasm and eager to learn more and prove they are the right person for the job. How do you channel their energy? How do you introduce them to the team and to their project? You probably don’t realize it, but you’re very lucky. Emperor Qin wasn’t dealing with highly educated, talented, young millennials looking for an opportunity to shine. His new recruits were simple people, uneducated, taken from the safety of their homes and having to face a deadly challenge. The gap between what his soldiers were prepared to do and what the emperor had in plan for them was enormous. So he needed to come up with an innovative solution. 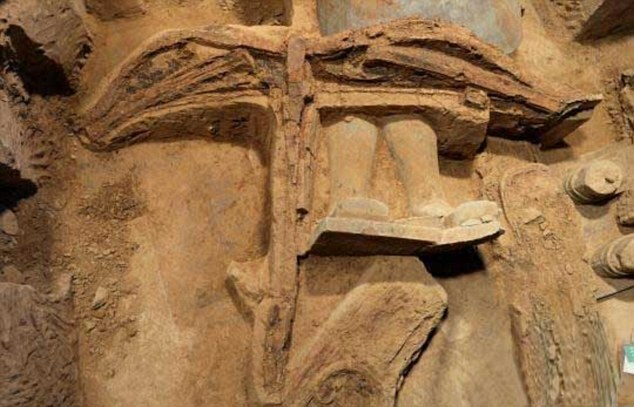 Archeologists pieced together the clues found at the Terracotta Army site and discovered that ancient Chinese excelled at forging weapons. Among halberds and swords, they discovered a crossbow so cleverly assembled, it was almost two millennia ahead of its time. The crossbow had a simple mechanism so it only took the new recruit minutes to put it together. The same weapon reappeared in Europe between 1000 and 1500, but these later versions were far heavier than what the ancient Chinese had. According to historians, the Chinese soldiers were charging the bows from a sitting position, making it easy to shoot arrow after arrow. Now picture again the battlefield. A storm of arrows drops down on the enemy’s pedestrian army. The emperor’s archers shoot arrow after arrow without being threatened. The enemy stands no chance. Now think about your own onboarding process. Do you accommodate your new hires so that they are ready to get started from day one? Are you handling their work needs, like desk, phone, computer, access ID from day one? We know, from experience, this is far more important that it seems at a first glance. 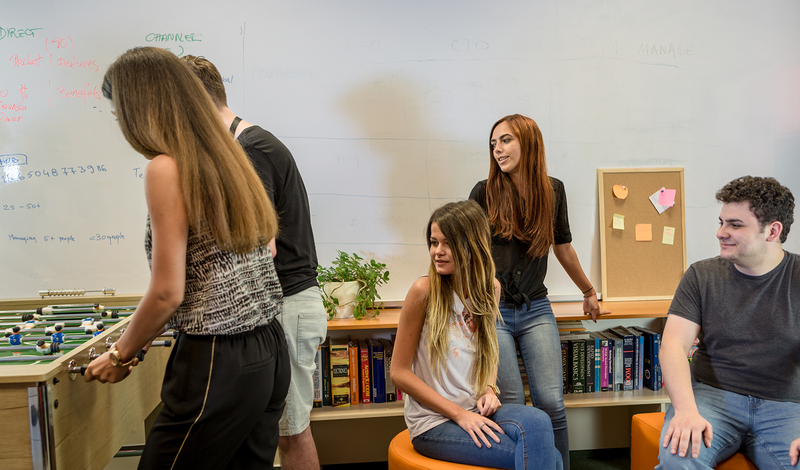 Every summer, we welcome about 10 to 20 interns that get to learn how to code for an international SaaS product. Of course, I’m talking about Hubgets. Over the past 2 months, our HR team has worked intensively to go through hundreds of applications and pick just the right people for our summer program. They held over 150 interviews and they chose 14 young programmers. So we had a challenging task: to properly welcome (a.k.a. onboard) a large group of young talents on their first day. Given the fact that Hubgets is a collaboration and communication software, it’s pretty easy to use it to introduce new hires to the team. For our interns, that’s even more important since their main priority is to learn the ropes of Hubgets. One of our Admins added all the new users (link to a short tutorial if you want to do that as well with Hubgets) and every intern got to perform small, pleasant tasks on Hubgets. Such as ordering a complimentary meal on the Lunch Orders Topic for our Happy Tuesday program. Or join the Football or Basketball Topics to meet with colleagues later during the week. After the first couple of days, they write down their experience with Hubgets and suggest improvements. This onboarding process proved to be both beneficial and effective as it cut down the time necessary to train new team members on the basics of the product. Valuable training hours are dedicated to more specific projects such as introductions to programming languages, backend and frontend development etc. Onboarding a single employee might seem easy to do, but what do you do when you have to welcome an entire team at once? The Chinese emperor can teach us yet another lesson on how to approach this. The crossbow was a genius invention, but the emperor had to have many crossbows ready at any given time, to equip his new soldiers. As historians of the day recorded, these weapons were mass-produced. Think of the level of innovation it required. Mass-production. 2,200 years ago. The emperor’s forgeries had an ingenious alloy recipe, standardized models for arrowheads and every other weapon the army used. The army relied on more than on-the-job training. To make that first-day count, they had an entire industry working on the clock. Of course, today’s challenges are completely different, but the lesson is similar: we need a pre-planned strategy that allows us to smoothly integrate entire groups into current teams. As a result, we managed to help our young colleagues smoothly fit in their teams, while saving our managers and team leaders valuable time. None of the problems we face today are as difficult (least to say) as the ones faced 2,200 years ago. Emperor Qin left us with a simple, yet very important legacy that we all know, at least intuitively: plan for success. Sometimes we simply get tangled in our day-to-day job that we forget we’re at war with so many competitors and that every day counts. Especially that first day that can make or break a person’s enthusiasm. But Emperor’s Qin ingenious onboarding strategy is a two millennial old reminder that planning ahead can help anyone build an empire.